According to the nation's city officials, the performance of local, regional and state economies have improved over the past year. Despite improvements, cities are still struggling in significant ways, signaling that growth is not keeping pace at a level that is needed for a sustained recovery. Even worse, economic indicators that reflect the condition of cities' most vulnerable populations have resisted even a modest rebound in the face of broader national recovery. 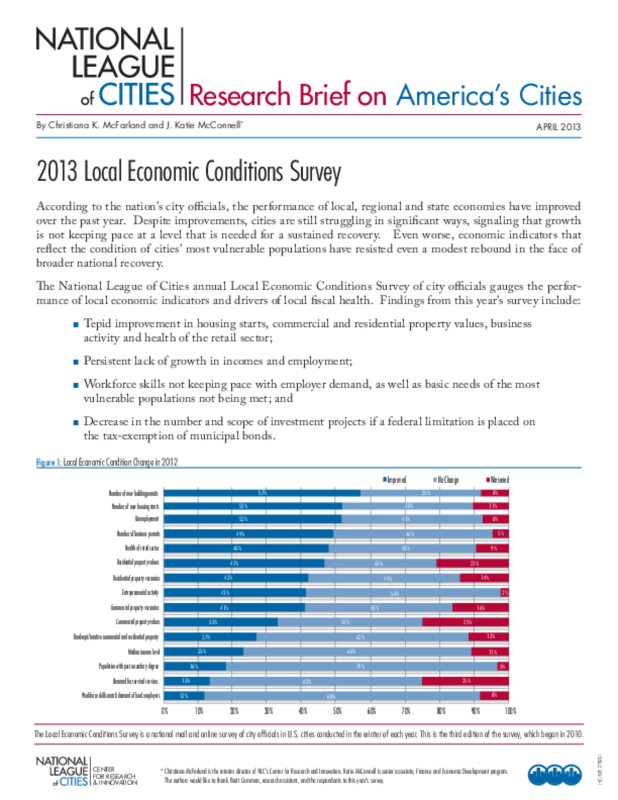 The National League of Cities Local Economic Conditions Survey is a national mail and email survey of city officials conducted annually in January. Surveys were mailed and emailed to the chief elected officials in a sample of 1,127 cities asking for assessments of their city's local economic conditions in 2012 and anticipated spending and policy priorities in 2013. In total, the 2013 data are drawn from 310 cities, for a response rate of 28%. Copyright 2013 National League of Cities.